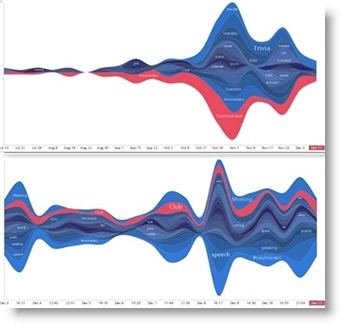 What Can StreamGraphs Tell You About Your Nonprofit's Twitter Strategy? This is the first of four innovative tools we're looking at in the Better Twitter Analytics series, seeking a new way of looking at data to help you shape and improve your nonprofit's social media strategy. 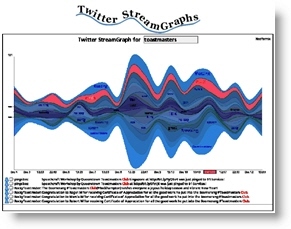 Twitter StreamGraphs is a Java-based visualization tool that can give you a quick overview of the last 1000 tweets around any search term on Twitter — and that includes usernames and Twitter lists. Put in your search term, your username with @ in front of it, or @username/list and what you get back, assuming that you have Java enabled on your browser, is a colorful visualization of the tweets related to your search. Each of the curving areas in different colors represents a different related word. Click on any one of those to see specific tweets listed at the bottom of the page. Along the bottom of the graph you’ll see the dates, and you can click on any of those to change which day’s tweets you’re looking at. So, basically, Twitter StreamGraphs is a search tool that gives you another way to visualize the results you get when you search for any keyword on Twitter. Pretty, yes, but is it useful? For an example, let’s take Toastmasters International. It’s one of those surprisingly rare cases where the Twitter username and the name by which most people know the organization are the same, which simplifies things a whole lot! What do the keywords here convey about the organization? How well does the content of the tweets correspond with the messages the organization puts out on its website and through other channels? In short, do the tweets reflect the brand? If not, there's an action for you! Now, what are other people saying about the organization on Twitter? So, how does this content overview differ from the message that @Toastmasters is putting out, and where do the two sets of terms overlap? 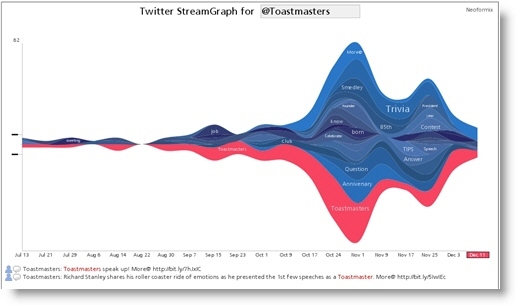 Click on a few dates on the StreamGraph to check out the corresponding tweets… What does this content tell us about the primary interests and concerns of @Toastmasters’ target audience? Is there an untapped area of interest that could/should be addressed? If so, it might be worthwhile for the organization to do a bit of experimenting — changing the wording of tweets to align more closely with the keywords used by the audience, and keeping in mind the interest of the audience in deciding what content to tweet. No organization is associated with one simple keyword, of course — not even when that keyword is its name. For a more complete analysis of your own nonprofit’s Twitter presence, you’d want to add at least one or two more graphs for comparison, scouting for keywords related to your mission and clicking on individual words in the StreamGraphs to find related terms people are using around that topic and what they’re actually saying. Remember, each graph covers just the last 1000 tweets. The @Toastmasters account covers a date range of July 13th to December 11th (the day I grabbed this screenshot), while the second graph, showing the last 1000 public tweets using the word “Toastmasters,” only goes back to December 3rd. Clearly, the volume of tweets about the organization by far outweighs those coming from the organization. That is to be expected, however: After all, it’s one voice compared to many voices. It would be nice to be able to compare date for date, to see if there's a correlation, but the volume of tweets is too different between the two search terms, so the resulting graphs are way out of scale. That's something to keep in mind for your own nonprofit, however, if your tweets and those related to your keyword search are somewhat more equal, which is more likely to be the case with a smaller organization, with a smaller membership/audience, and with a more targeted keyword search. A little clicking around reveals that many of the general tweets including the keyword "Toastmasters" are location-specific. This is not surprising, perhaps, as an international organization tends to interact most directly and most often with its members at the local club level — that’s often where the most immediate “relationships” are developed with members, day to day. compare the club accounts’ content with their own local audiences. Again, we’d want to look at the dominant keywords, and how well the outgoing messages match with what is of most interest to the audience. What else might you do with this tool? If you are using a unique hashtag to track a campaign, you could generate a StreamGraph for your hashtag (without the # sign — this tool doesn’t seem to be able to handle the special character) and see if there’s a relationship between the frequency of “outside” mentions of that hashtag with the pattern of your organization’s tweets. Looking at the audience use of keywords and the specific tweets, too, you might be able to gain a sense of whether they’re getting their questions answered, which might suggest topics for future tweets. And again, it might be useful to adapt the club’s Twitter content to more closely align with keywords that come up in the general conversation of the target audience. Worth a try? This isn’t the kind of data you can quantify easily and take into the boardroom, but if you’re the person in charge of your nonprofit’s Twitter strategy, there are useful insights to be gleaned from a little quality time with the Twitter StreamGraphs tool. I’ve just skimmed the surface here, with the focus on comparing the organization’s outgoing messages with what’s going on in the audience and looking for points of relevance. We haven't even looked at what a Twitter Lists search might turn up! 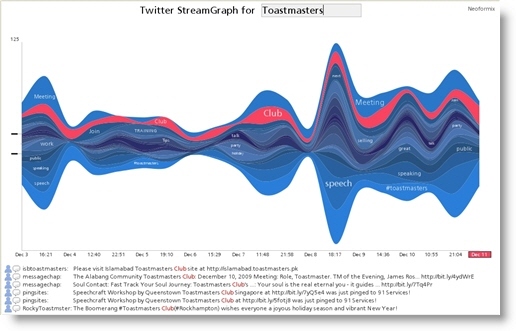 How could your organization use Twitter StreamGraphs? What other information could be extracted, to help you make your nonprofit's Twitter strategy more effective? This is an excellent deep dive into StreamGraphs!! I learned a couple of new ideas that I had not thought of. Wow ! that’s great …..hope to expect more. Avinash, thank you for inspiring the deep dive - and making analytics fun! I'll be playing for this for a while to see how it works and what I could do with it. Thanks for the tip and post about it!